Marriages are a big deal in the Indian context. Divorces in India are still the cause of family scandals & second marriages are still considered a taboo. In India, Arranged marriages are still the norm here, though love matches are slowly gaining acceptance. From the traditional way of finding an appropriate match through the family network to matrimonial sites, many ways exist for those looking for a suitable match. Family Network - Any person familiar with the Indian family set up will understand the influence that the family network has on deciding the most appropriate match for a prospective bride & groom. In many cases there is tremendous family pressure on the girl/guy to accept the family's decision, as far as a suitable match is concerned. This traditional family network does not just comprise of the parents & elder siblings, but also includes uncles & aunties, cousins, maternal & paternal relatives, & other members. But with time & western influence creeping into the Indian society, this influential family network is almost on the verge of disintegration, though it still exists in rural & semi-urban areas to quite an extent. Matrimonial Ads - Before the advent of internet, publishing matrimonial advertisements in magazines and newspapers was a popular way of finding a suitable match. There are still many people who opt for this alternative & many popular dailies still have an exclusive section devoted to Matrimonial Ads. Matrimonial Agencies - Yet another alternative which was quite popular among people searching for a suitable match was to register with a reputed matrimonial agency. These agencies basically match the suitable candidates with each other, in a way that both the parties are satisfied. 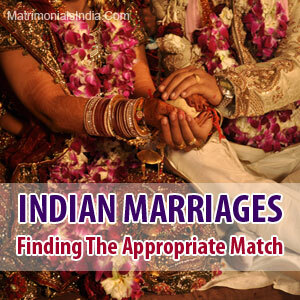 Online Matrimonial Sites - There is no doubt about the fact that matrimonial sites have emerged as the most popular alternative for finding a suitable match. There are several reasons that have attributed to this popularity - time, efforts & money saved, quicker, access to the content rich profiles of prospective brides and grooms, advanced search options, & many more. Yet another of the advantage of the Matrimonial Sites which has made it popular among the tech-savvy generation of today is the absence of any intermediary. There is complete freedom to choose a suitable match as per one's liking. Matrimonial Sites have emerged as a perfect platform where the prospective brides & grooms can contact each other, have online chats, share information, & may even take the matter forward, if all goes well.